Imagine a world with better chances and more choices for the visually disadvantaged. 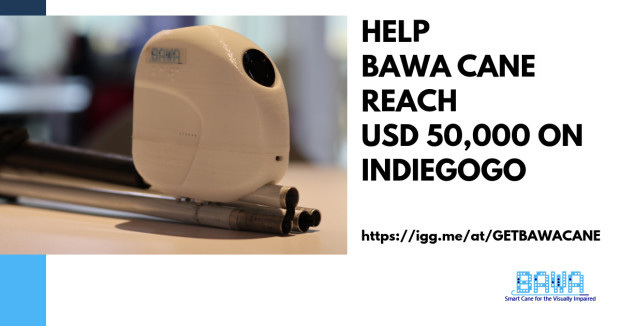 If you haven’t heard, BAWA Cane is crowdfunding on Indiegogo. In all honesty, we need your help to build BAWA Cane. That is to bring BAWA Cane to the world to empower every blind and visually impaired across the globe. What if technology gives them a reason to get out there and live life to the fullest? What if technology can break their accessibility barrier? What if technology can help them like a partner to become more independent? That is what BAWA Cane is all about. That is why we have embarked on this journey to empower every blind and visually impaired in the world in their pursuit of mobility, safety, and independence. That is why we created this company, and we got the right team and the right partners to do it. Partners with a proven track record of bringing innovative technologies and exciting content to market. For that reason, we strongly believe that we can revolutionize and impact the lives of blind and visually impaired across the globe with BAWA Cane. How will project BAWA Cane unfold once we raised the money on Indiegogo? We have set a goal of USD 50,000 within 40 days. The funds raised will go into design for manufacturing, procurement of electronic components, and mass production. First of all, what you are seeing on our Indiegogo campaign are proof of concepts that had undergone several prototyping cycles and finally we have got the golden sample. That is to say, expect the final product to be more polished and of supreme quality. In particular, we are developing the best version of the clip-on with a better center of gravity, and as anyone who has built a simple plastic item knows – it’s a detailed process requiring 3D modelling, molds and more. Circling back to the question of is BAWA Cane an attachment or a whole cane, to answer that question here again, BAWA Cane is an attachment for existing cane. For a limited time throughout our Indiegogo campaign, we would like to announce that BAWA Cane pre-ordered within this 40 days will come with a premium quality white cane of preferred length. Furthermore, BAWA Cane comes with 1-year warranty and customer support. Through this campaign, you are empowering millions with technologies that may change their mobility and access to get to what they want to achieve – to work, to participate, to socialize. Maximizing our users’ ability to participate in society means a lot to us. What are you waiting for? Be part of this revolution!